Sausage and mushroom pizza! 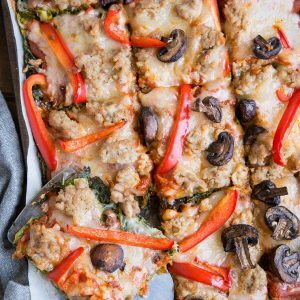 A dreamy low-carb pizza recipe with bell pepper, Italian sausage, mushrooms, and sun-dried tomatoes on top of kale pizza crust for a low-carb, paleo, keto dinner of champions. A couple days ago, I showed you my recipe for Kale Pizza Crust. Have you made it yet? Have you made it yet? 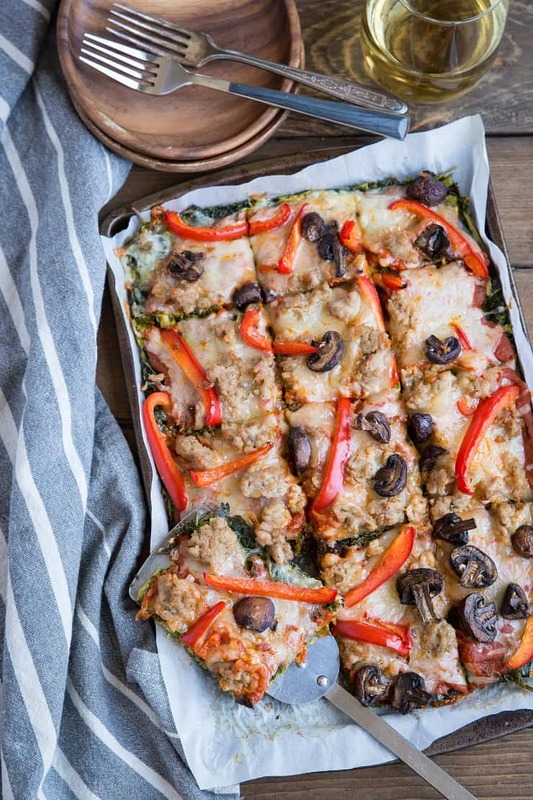 We all have our personal favorite pizza toppings, but occasionally we could use some inspiration…pizzspiration, if you will. Honestly, I don’t think I’ve ever made the same pizza twice…I just can’t get enough of pizza variety (check out my pizza archives for lots and lots of examples). I will say, I almost always add some sort of meat, and am all about those show-stopping ingredients that give a POW of flavor. In this case, I went with bell pepper, sun-dried tomatoes (underneath the cheese to keep them tucked in), garlic, turkey Italian sausage, and mushrooms. Cheese? Classic mozzarella with a gruyere infusion. When it comes to the sausage, I go with a ground turkey Italian sausage that’s sold in a chub (as opposed to links), although you can go with your absolute favorite sausage. I like turkey sausage because it is leaner (less grease on your pizza) while still being super flavorful. I use this sausage, which you can buy online or from Whole Foods. One trick I always, always employ with my vegetable toppings, is I saute them before I use them as toppings. Sure, they get cooked in the oven, but not enough in my humble opinion. I like my bell peppers soft and almost caramelized and I enjoy my mushrooms softer as well. The pre-saute gives the vegetables WAY more flavor and also makes them tender, making them easier to chew through. SO! I saute the bell pepper and mushrooms with garlic and then add the turkey Italian sausage. Once cooked, I spread the mixture over my be-sauced and be-cheesed pizza, bake it all up in the oven, then dine. Omit the garlic to make low-FODMAP. Replace the gruyere with more mozzarella. Replace turkey Italian sausage with your favorite sausage, pancetta, prosciutto, or chorizo. Omit bell peppers or replace with onion or artichoke hearts. Get creative! Do your thang! Do it for the cheeeeeese! 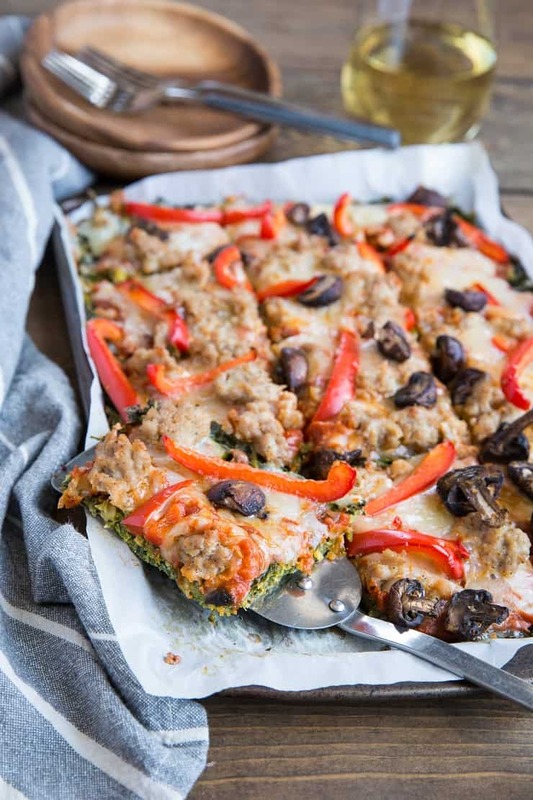 Prepare the Kale Pizza Crust according to instructions (or use cauliflower pizza crust or almond flour pizza crust). Preheat the oven to 400 degrees F. Spread the sun-dried tomatoes over the pizza crust evenly, followed by the mozzarella and Gruyere cheese. Heat the olive oil over medium heat in a large skillet. Add the bell pepper and saute, stirring frequently, until bell pepper begins to soften, about 1 to 2 minutes. Add the mushrooms and garlic and continue sauteing, stirring frequently, until mushrooms soften and begin to turn brown, about 2 to 3 minutes. Scoot everything off to one side of the skillet and add the ground turkey Italian sausage. Cook, stirring occasionally, until sausage is cooked through, about 3 minutes. 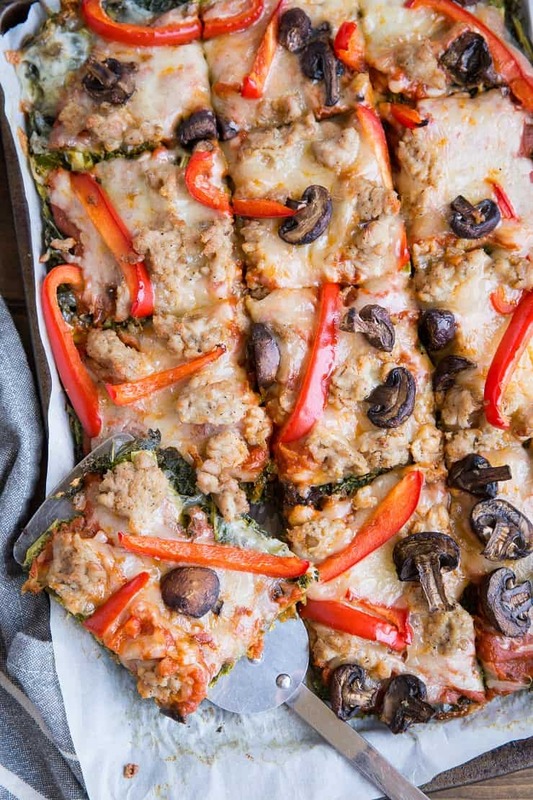 Evenly spread the sauteed vegetables and sausage over the pizza (on top of the cheese). Place in the preheated oven and bake 10 minutes, or until cheese is melty and golden-brown. Remove pizza from the oven and allow it to cool 5 minutes before slicing and serving.